There's no doubt that Barcelona holds some of the most beautiful architecture to date. Gothic style cathedrals are spread throughout. Many sightly churches offer their breathtaking views. The vibrant and creative works of Antoni Gaudi cannot be missed throughout the city. Some of his most famous work in Barcelona include the Sagrada Familia, Casa Vicens, Palau Güell, Park Güell, Casa Milia, and Casa Batló. Gaudi captures the Catalan modernism in Barcelona. This meant favoritism towards curves rather than straight lines, heavy or “gaudy” details, asymmetry with shapes, and the famous use of stained glass, iron, and stone, which were all new materials for that time period. 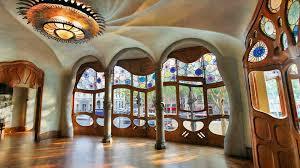 Some of his work worth further mentioning are the Park Güell, La Sagrada Familia, and Casa batló. 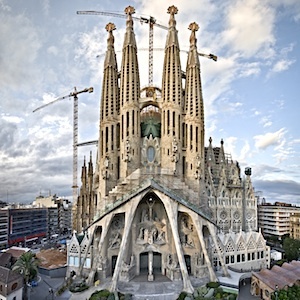 Although La Sagrada Familia is currently under construction to this day, it is still considered a masterpiece by Gaudi. The asymmetrical design of this building is very refective of his style. Staying true to Gaudi's love for curves over straight lines, the Park Güell stands above the city, displayings it's series of curvy walkways. Stone is also used here along with beautifully colored mosaics. The Casa Batló is a remodeled private home nicknamed “House of Bones” due to its exciting curved windows, arched roof, and severe lack of straight lines. Every single room of the home displays incredible tile and vibrant colors. 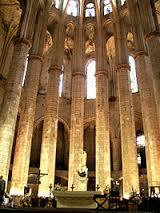 Built between 1329 and 1386, another great example of Catalan Gothic architecture is the Santa Maria del Mar. The exterior was designed to include images of Saint Peter, Saint Paul, Saint John. The interio contrasts the drastic look of the outside, bringing a view filled with spaciousness and light. Magnificent octagonal columns support a ribbed vault that offers abundant sunlight. Exciting and colorful stained-glass windows have remained through various time periods, and the church claims to have the most slender stone columns in the world.